In order for me to make the most of my time with my students I want to learn as much as I can about them as quickly as I can! 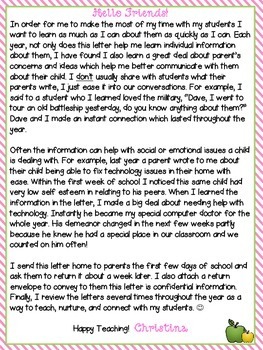 Each year, not only does this letter help me learn individual information about them, I have found I also learn a great deal about parents’ concerns and ideas which help me better communicate with them about their child. 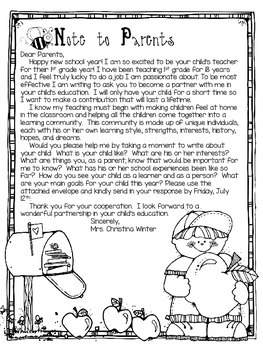 Included in this download are color and black and white versions of the EDITABLE letter for you to send home to parents giving them directions to write to you about their child. 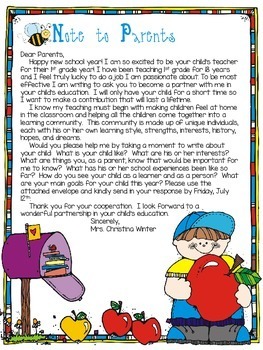 Also included are helpful tips and examples.